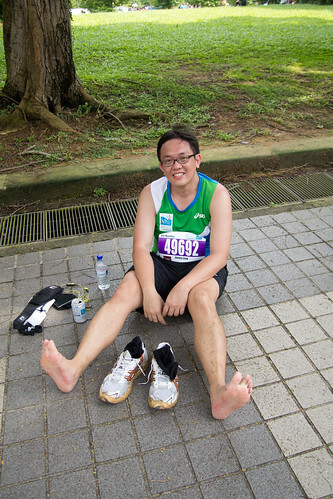 This post is a little outdated, considering that the Standard Chartered Singapore Marathon has been over for at least a week and a half. But hey, accolades are meant to withstand the test of time so better late than never! So earlier in the year, I decided to sign up husband for the half marathon. Yes, you heard me right. He’s been bragging that 10km races are no longer incentives for him to train because he can simply run with little preparation so I thought it a fab idea to put his money where his mouth is. Except that it was MY money because I PAID for his registration. As expected, the man had so little training, I was genuinely worried about him running the race at all. I mean, he is no spring chicken and he’s going to run from Sentosa to the Padang? Hmm. But he was all gungho and confident about it so the plan was for him to go forth and run without killing himself. He actually completed the damn thing! Granted, he jogged for the first 10km (operative word being JOGGED, seeing how he actually could stop and take touristy snaps with Speedy Gonzales at Universal Studios Singapore) and took a leisurely stroll for the remaining distance. But he didn’t utilise the $10 note that he had stashed in his pocket for emergency cab fare so hurray for him! Perhaps the full marathon next year then?